Global Aerospace, a leading international aviation and aerospace insurance provider, is at the forefront of insuring the Unmanned Aircraft Systems (UAS) industry. 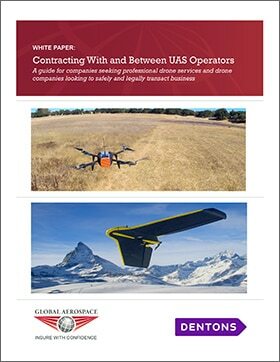 In partnership with Dentons, an international law firm expert in UAS, Global Aerospace published this free white paper, the second in a series, as a guide to contracting drone services. With legal advice for those interacting with and within the drone community, this free white paper also includes a sample Agreement for Drone Services contract and addresses many questions on the safe, legal use of drones. How do you navigate the existing challenges of the regulatory environment? What are the top 10 things you should be asking a prospective drone service company? How can legally enforceable contracts help protect drone manufacturers, operators and users? Yes, I want answers to my questions on the safe, legal use of drones.